This dish is a simple casserole, but the simplicity is what makes it so great! There are quite a few variations. Meatlovers can add chicken or even bacon. Some recipes ask for adding flour directly onto the mushrooms, but I got lumps that way. Therefore I chose to make the sauce seperate and used a variation with browning the flour. This browning of the flour gives extra flavour and makes everything blend together really well. If crème fraîche is hard to obtain in your country, I suppose you could replace this with sour cream or a bechamel sauce. The only downside to this dish are the amount of calories. Yes there are loads. So to just to make peace with that guilty conscience, I recommend serving it with a green salad. make sure you have your flour and crème fraîche ready to go! 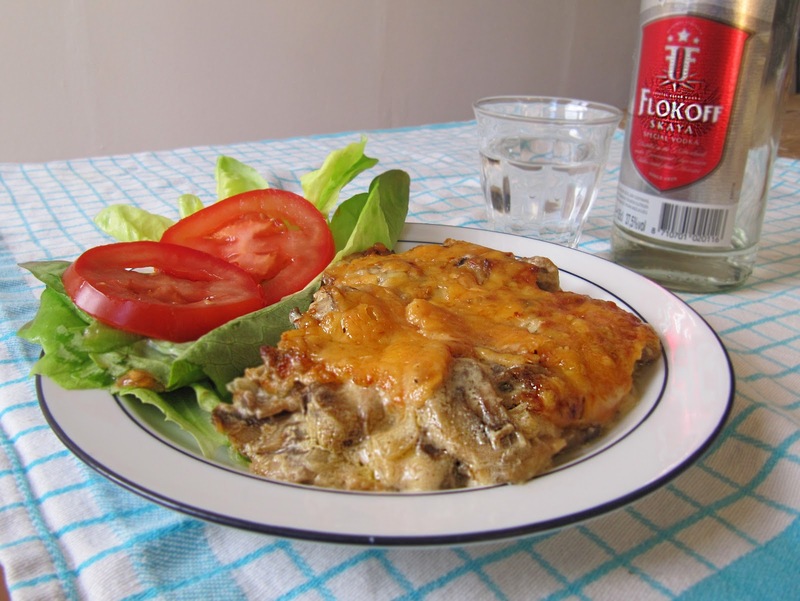 Now if you still hate mushrooms.. just go straight for the Vodka, На здоровье! Nice presentation for a recipe writing!! !